Look, I’m not going to argue with you all on either of those thoughts. First of all, Bud Selig has been perceived as (and will continue to be thought of going forward) as the weakest commissioner in all of professional sports. He has never won any major showdowns with his union (the Major League Baseball Players Association). He and his owners caved when Major League Baseball was on the brink of lockouts and strikes over the last few years. He was especially feeble against Donald Fehr, the former head of the MLBPA, when it came to testing for performance enhancing drugs. And the time he did fight back, we witnessed the most bizarre and unpopular strikes in sports history in 1994. For those of you “new schoolers” who were too young to remember, the Major League Baseball strike of 1994 not only wiped out the second half of the season – it also wiped out the World Series. I’m sure the last remaining fans of the Montreal Expos are still plenty forgiving of Selig. After the 1994 strike, the fabled “Home Run chase of 1998” where sluggers Mark McGwire and Sammy Sosa were allegedly ‘roided out of their minds while smashing Roger Maris’ single-season home run record occurred on Selig’s watch (Selig allegedly knew of this and turned a blind eye). His behind the scenes enabling allowed Frank McCourt to purchase the Los Angeles Dodgers, in which McCourt would later run into the ground. Selig made the controversial decision to declare the 2002 All-Star game a 7-7 tie after 11 innings because both managers used their entire rosters. He made the Houston Astros – not the Arizona Diamondbacks – switch leagues to start the 2013 season. And last, but not least, granting home field advantage in the World Series granted to the winner of the All Star Game in the same season in 2003. 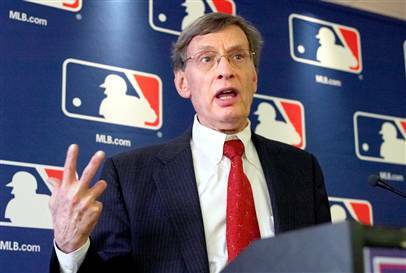 And more importantly, Selig made his owners AND players money – lots and LOTS of money. All of MLB franchises increased in value, with my beloved New York Yankees valued the highest at $2.3 billion and the Rays “bringing up the rear” at $451 million. The average salary of a baseball player is $3.2 million. As for the TV revenue, here is how Selig negotiated those deals. Last season MLB made deals with Fox and the Turner networks. Fox now pays around $4 billion over eight years (close to $500 million per year) while Turner pays around $2.8 billion over eight years (more than $300 million per year). The deal Selig cut with ESPN last season was even more lucrative – a $5.6 billion deal that pays around $700 million per year. So you see folks, while good ‘ol Bud made his fair share of gaffes and half-baked decisions, you can’t deny the dude helped baseball become more popular with fans and put it on a fast track to the money train. And the sport itself should be thankful for that.